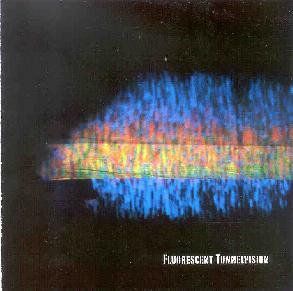 Various Artists - "Fluorescent Tunnelvision"
In 1999, the Mother West label released the compilation Turn Century Turn: Space Rock & Psychedelia From Around The Globe. Not only was this a fantastic collection of bands, but I considered it an important release because it featured much of the more difficult and even avant-garde side of what can be consider space rock and psychedelic music. That is, don't expect, for the most part, to hear Hawkwind and Gong styled music here. Fluorescent Tunnelvision is the 2-CD follow up, released on the Submergence label, a division of Mother West. I've been hearing about this for a long time from project coordinator (and Escapade drummer) Hadley Kahn, making this one of the most anticipated releases for me this year. And I'm pleased to report that those who enjoyed Turn Century Turn can run confidently to get this one as well, for some of the best examples of the more adventurous sides of space and psych. And like Turn Century Turn, all tracks are exclusive to this release. Here's the rundown on the participants. Circle, Ektroverde, and Tree Sine each have a track and are all related by common member Jussi Lehtisalo. Circle and Ektroverde have both been written about at length in Aural Innovations and their contributions to this set are among their best. Tree Sine have no releases of their own out but at least 3 of the quintet's lineup include members of Ektroverde, and indeed the music is similar, though percussion and electronics seem to be equally prominent partners. For information on Circle and Ektroverde you can visit the Ektro Records web site at: http://www.ektrorecords.com. New F/i music is a rare treat these days, and fans will dig their entry to the set. The classic jamming F/i sound is here combining lumbering rock with classic space electronics and eerie atmospherics. When will we get a new full-length F/i release?!!! The F/i web site is at: http://www.execpc.com/~bwnsng/fi.html. Fluorescent Tunnelvision rank Krautrock pioneers Faust as contributors too. Not much to say other than this is nearly 9 minutes of classic crazed Faustian experimentations. Another contributor that all AI readers probably know is SubArachnoid Space. Not much to say here either except that their track is 14 minutes of total cosmic space rock BLISS! Visit SubArachnoid Space at: http://www.subarachnoid.com. I first heard Pseudo Buddha when I reviewed their debut CD in AI #9. This track is more recent having been recorded in November of last year. It's a little different from what I heard on their Motive CD, though it's a killer tune and one of my favorites on this compilation. The music starts as a dark droning atmospheric piece, though soon takes off into a totally cosmic rumbling acid rock jam with a huge variety of percussion instruments and trippy space synths. Check them out at: http://www.pseudobuddha.com. Escapade's contribution is a solid spacey Krautrockish jam. It rocks out and is mucho trippy, and the bass will pound a hole in your chest. These guy don't get a fraction of the recognition they deserve. Visit Escapade at: http://www.motherwest.com/escapade. Related to Escapade by common member John Ortega is Oránj Climax with a percussive ambient exploration. I've heard quite of bit of their music now and think it's much more busy and interesting than a lot of ambient space that's out there these days. Oránj Climax can be reached at: Oranjclimax@aol.com. There are two general sides to Djam Karet. On the one hand there's the heavy rockin' progressive rock side, and then there's the ambient space side. Listen to their Suspension & Displacement and The Devouring CD's side by side and prepared to blown away by the diversity between the two. But this track seems to cross over a bit between both. There's a clear sense of space, but it's also got rockin' prog elements and even a bit of a King Crimson feel to it as well. Visit Djam Karet at: http://www.djamkaret.com. Quarkspace's track is called "D.O.B.H. #3", which leads me to believe it was recorded during the same sessions as the tracks on their Spacefolds 6 CD as "D.O.B.H" #'s 1 & 2 were on that release. A nice Quark jam that rocks out a little more than they typically do. Visit them at: http://quarkspace.com. Melodic Energy Commission had two albums out in 1979 & 1980 (with Del Dettmar). Don Xaliman told us a few years back in an interview that he was working on new MEC music and we're finally able to get a taste. Coming directly after the Quarkspace track I'd say this actually reminds me of some of Quarkspace music, with Randy Raine-Reusch's ethnic percussion, gong, and flute helping to give the music its character. Hope to hear a full-length from MEC soon. Visit their web site at: http://www.melodicenergy.com. Tombstone Valentine's entry is a treat because TV have yet to follow up their Hidden World album from a few years ago. One of the more purely psychedelic contributions to this set, there's some gorgeously trippy psych guitar and violin, though I wish newcomers to the TV experience would have got to hear Richelle Toombs' beautiful vocals. Visit them at: http://netdirect.net/~wilkerson. Mushroom combine jazz and space rock unlike any band I've heard. Some really fantastic stuff. This track has a nice funky feel to it, though overall it's not one of the more exciting tunes I've heard from Mushroom. But their own full length releases come with some of my highest recommendations so check them out at: http://www.innerspace.com. Volcano The Bear is definitely the entry that falls most into the avant-garde category, playing experimental music whose place in the space realm is more in the background atmospherics, but is undoubtedly "out there" and will appeal to the adventurous listener. You can get more information at: http://homepages.stayfree.co.uk/vtb/. Fluorescent Tunnelvision includes two contributors from Russia, both of whom are new to me. The liner notes list 6 members of Zelany Rashoho but no instrumentation, though I think I'm hearing electronics, bass, maybe guitar, and picolo or some such instrument. The repetitive, almost lo-fi, pattern plods along with the wind instrument soloing steadily throughout. Zelany Rashoho can be contacted at: dg_swop@nadne.ru. 2012 is another Russian ensemble I've never heard before now, I recognize Yuri Elik's name as the host of the Ole Lukkoye and Tribe of Cro web sites. I'm assuming that visuals are a large part of what they're about as of the 6 members, I'm seeing credits like multimedia performance, photos, and two members on slides. Musically, though, 2012 play ambient space with dark drones and oscillating waves of various electronic patterns. You can get more information at: http://www.2012.spb.ru. Both Zelany Rashoho and 2012 are interesting but not among the highlights of this set. For more information on Fluorescent Tunnelvision you can visit the Submergence web site at: http://www.motherwest.com/submergence.